Long time, no talk. It's been an insane couple of months. We moved across the country, bought a house, & had a baby. I think our life is finally settling down. 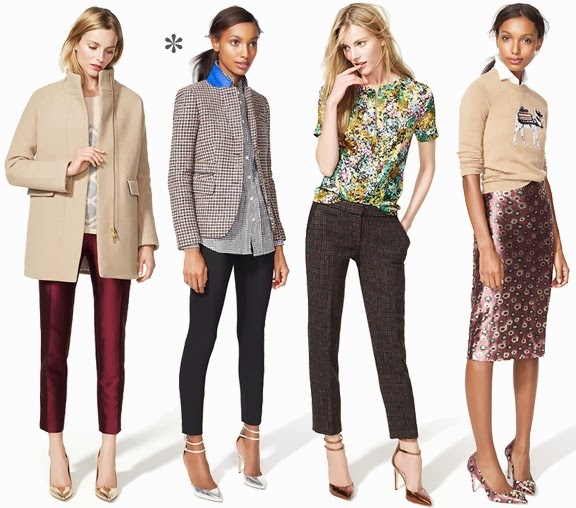 I had a peek at J.Crew's October looks to love, and found a few crush-worthy outfits. I am especially loving the metallic heels for fall. Aren't you? I was doing some cleaning out of my Pinterest boards, and after finding a pin from your site, I thought I'd pop by and see how you were doing. Thanks for sharing that adorable picture of your super sweet baby girl! Congrats and best wishes on settling down with a newborn again. Our son just turned 2--which is an awesome age--, and while I'm 95% ready for another baby, there's that last 5% that remembers with horror the deep exhaustion of the first months. I hope you're settling down well, and I'm looking forward to posts from you again. Also, since you've got a new house, maybe some home decor posts? Have a great one!